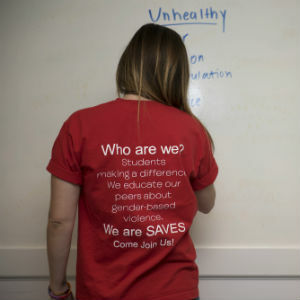 The Sexual Assault and Violence Education by Students (SAVES) peer education group is one of many popular student programs at the Women’s Center at Virginia Tech. When Sarah Preston transferred to Virginia Tech two years ago, the trauma of a past sexual assault sparked her search for a trusted counselor. She found one at the Women’s Center at Virginia Tech, located inside a two-story house on Washington Street whose exterior yellow color seems to reflect its purpose — to be a light of support, safety, and empowerment for women. “I attribute my success to help from the Women’s Center, and the ways they have helped me change my day-to-day life and my daily habits,” said Preston, who will graduate in May with a degree from the Pamplin College of Business, where she is majoring in marketing. Preston has been seeing a counselor at the Women’s Center since 2017, at first once a week and now bi-monthly. During her sessions, she is learning tips for coping in a healthy way and for recognizing stress. This year, the center is celebrating 25 years of helping students like Preston and faculty and staff across campus with a broad mission. The center, which offers everything from counseling and support services to professional programs and support for university policies that advocate for women, will host a series of special anniversary activities through May. The center also is celebrating Women’s History Month, which is nationally recognized in March, with various events. The Women’s Center’s beginning dates back to 1994. It opened in Lane Hall with three staff; director Penny Burge, who now is a professor emerita; and a central mission — “to aid Virginia Tech in creating a more diverse, inclusive, and open environment for learning and working for women and for men, an environment in which equity for women can flourish.” This original proposal was drafted by the Coordinating Council for Women’s Concerns. The council, which included female leaders from all parts of Virginia Tech, formed in 1989 to help identify problems and opportunities for women, propose solutions, and advocate for university policies. These voices were needed among what many believed to be a male-dominated culture at Virginia Tech, said Pat Hyer, an associate provost emerita who was instrumental in starting the Women’s Center. Now, 25 years later, the role of the Women’s Center is as relevant as ever. Its staff has grown to nine people, including co-directors, victim advocates, program coordinators, and even a therapy dog named Dr. Yogi, a golden retriever. In the past four years, the number of people, mostly students, receiving counseling services at the center has increased 85 percent, said Christine Smith, one of its two co-directors. In the 2017-18 academic year, the center saw more than 200 cases, the largest in its history. One of the driving forces behind this influx is a change that allowed the center to be a confidential resource for victims of sexual assault. In 2011, federal guidelines emerged that required university employees nationwide to report all instances of sexual misconduct to authorities. After its cases dropped drastically, the Women’s Center was removed from the mandatory reporting requirement, with help from President Tim Sands, said Smith. Because the center’s counselors support students, staff, and faculty in multiple settings, from attending court hearings to talking with police, their role as confidential advocates is vital, she said. “We have played a pivotal role in ensuring that folks come forward and receive the support and advocacy that they need to be successful in continuing their education here,” Smith said. The center also trains university employees who interact with students to ensure that they know how to respond to certain situations. “The increase is an indication that we’re where we need to be, and we’re doing what we need to do and we’re having an impact,” said Anna LoMascolo, a center co-director. But its work is not only counseling and advocacy. Over the years, the center, which reports to the provost’s office, has implemented a bystander intervention program, established an American Council on Education award-winning women’s leadership and mentoring program, and facilitated salary negotiation workshops for students pursuing their first jobs after college, among many other programs. The center also fosters connections and networking among professional women at Virginia Tech and across the state. Representatives from the Women’s Center serve on committees and are a part of conversations university-wide that relate to gender equity and similar issues. For example, the center spearheaded a project to include lactation rooms inside campus buildings, and it was instrumental in forming the Virginia Tech Women’s Alliance and Caucus, a group that serves as a voice for women of all identities in the university governance process. It also has helped to advance university polices and services to support women, such as dual career programs for faculty hires, the extend-the-clock policy for tenure track faculty, and inclusion of staff in professional development efforts. Many Virginia Tech students volunteer as a part of multiple center initiatives. One is the Sexual Assault and Violence Education by Students (SAVES) peer education group, which sponsors programs to address sexual assault, gender-based violence, and related issues. Another is the AWARE program. It comprises a group of Virginia Tech students who visit Blacksburg Middle School regularly to talk with girls in sixth, seventh, and eighth grades about healthy relationships, self-esteem, body image, and other topics that are important to them. Hayley Owens, a student leader with AWARE, manages the 20 student volunteers who travel to the middle school each week, and she works with them to plan the discussion topics. The group also plans an annual day when the middle schoolers visit their Virginia Tech mentors on campus. The volunteers “are passionate about passing along their experiences to younger students,” Owens said. But Owens, who also works as a receptionist at the Women’s Center, said her involvement with the center represents her personal mission. As a fifth-year architecture student in the College of Architecture and Urban Studies, she’s even designing her senior thesis as a counseling center inspired by her experience at the Women’s Center. These relationships are important now more than ever. Because of national events and related discourse, LoMascolo and Smith said there is a stronger need for the Women’s Center to serve and amplify the voices of women everywhere, in particular those who feel marginalized. There are greater efforts across the globe to ensure that women are represented in all areas of society, from Congress to the boardroom, and even through the resurgence of MeToo, a campaign to support survivors of sexual violence and to end it.